Job offer: We are looking for teachers who are native speakers of English. Do you love seeing the smile on a child’s face? Do you want a job that is both rewarding and challenging? 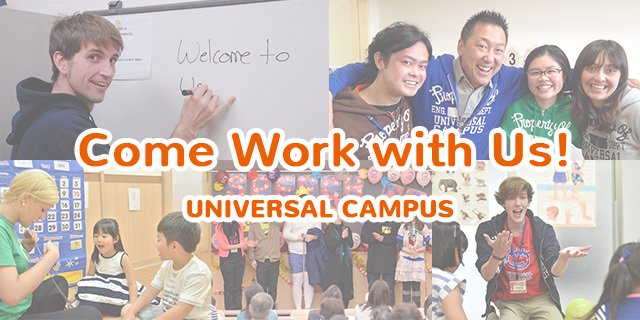 Come work with us at Universal Campus! We are always looking for energetic, enthusiastic, and responsible people to join our staff. Our goal is simple: to make our students the best English speakers they can be. We have a clear, well-planned curriculum to help them reach their goal. Full-time contracts with visa sponsorship are available to qualified applicants. In order to assure a student’s progress, we prepare various lesson plans and programs. Our teachers teach the same classes for an entire year. Teachers are able to see each student’s progress and growth, and have the opportunity to get to know the students well. Our students are mainly 5 to 12 years old. *Teaching guides and materials are all provided to the teacher. At Universal Campus, there are six picnics a year. We do things such as BBQ’s, going to aquariums, visiting the Space and Sience Museum, and so on. The picinics are always a lot of fun and are a great way for kids to be able to apply their English skills outside of the classroom. We have Summer English Camp for two nights every year. For this event, teachers practice for a dance routine they will teach to the kids at camp. 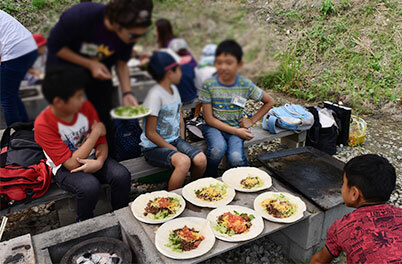 We cook food with the kids, do fun activities like swimming or canoeing, and have a big campfire to toast marshmallows. 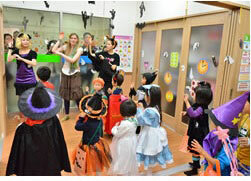 The Halloween Party is very special for native teachers. 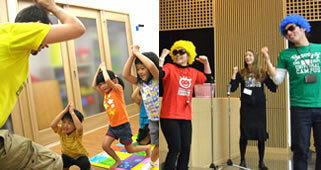 Kids and teachers wear interesting costumes, participate in lots of fun Halloween activities, and get lots of candy. 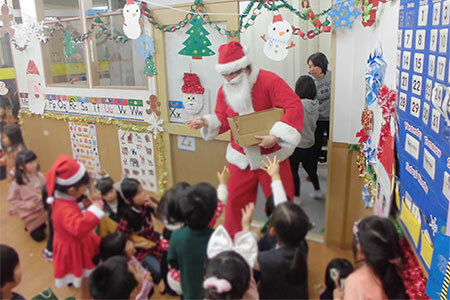 Kids can learn about Christmas by joining in special party activities and celebrating the holiday with teachers. They also have the chance to get to meet Santa Claus. Our teachers not only build up their teaching skills, but business experience as well. 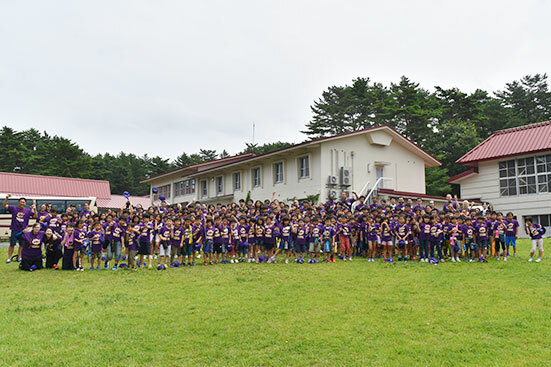 They have many opportunities to gain a better understanding of Japanese culture by communicating with Japanese students and their parents, as well as working as a team member with Japanese staff members. Interacting with students and their parents in the lobby is very important to build trust and discuss the progress of students in class. It also gives native teachers the opportunity to learn how to properly communicate with Japanese customers. After school, native teachers and Japanese teachers clean the classrooms together. By keeping the school clean, we are ensuring that students can learn in a safe and hygenic environment. Native teachers have sample lessons to introduce UC to prospective students and their parents. It’s the first time for many students to immerse themselves in English, so teachers should support and encourage students to enjoy English. * Special events such as parties, summer camp, picnics, etc. occuring on Sundays will be working days, sometimes with different working hours. * 123 days off a year. * One week-long vacation several times throughout the year. *Every month’s salary is a fixed amount. Social Insurance (Health Insurance /Japanese pension / workers insurance) is provided. All transportation fees are reimbursed. Housing isn’t provided by our company, but we can help new teachers find housing if necessary. Visa sponsorship is available for eligible applicants. ※Due to the large number of applications we receive, only candidates who pass our screening will be contacted by us. Anyone can become a good English speaker. The most rewarding part of our job is seeing students learn and grow as individuals. There is nothing better than seeing the smiles on students’ faces when they realize that they can communicate with us in English. The relationships you can build and the experiences you can share with our students are life-long treasures. Our well-planned curriculum and experienced, supportive team members make it easy to quickly become a confident, professional teacher. All that is required is a passion for people and the desire to help people realize their dreams!